ANKARA (Reuters) - The Turkish parliament is likely to extend by a year a mandate authorizing the sending of troops into Syria if needed after the government said the possible use of chemical weapons by President Bashar al-Assad posed a threat to Turkey. The government motion, due to be voted on by parliament on Thursday, paints a bleak picture of the conflict in its southern neighbor and says Turkey would be the country the most affected by escalating violence there. "Developments show that the Syrian regime has reached a point where it is ready to use any methods or weapons against international law," the motion said. Ankara and Western nations have blamed Syrian government forces a nerve gas attack on a Damascus suburb on August 21 that killed hundreds. The Syrian government, backed by Russia, blames the Sunni rebels. "Turkey is the country which will be most affected by any attacks by the regime and the uncertainty and chaos in Syria," the government motion said. Through its rights drawn from international law, Turkey is obliged to take necessary measures against any kind of action from Syria which presents an "open and near threat," it said. Turkey, one of Assad's fiercest critics, has advocated military intervention in Syria and has grown frustrated over what it sees as Western indecisiveness. While it has the second-largest military land force in NATO, it is unlikely to act alone in any military operation, with public opinion largely against intervention. 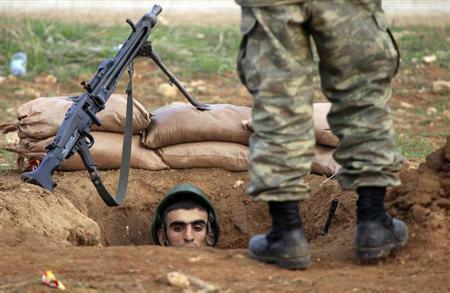 A current parliament mandate allowing Turkey to send troops into Syria expires on Friday. The ruling AK Party has a strong parliamentary majority and the extension is expected to pass despite opposition, especially from the main pro-Kurdish party. Turkey, which shares a 900 km (560 mile) border with Syria, has seen the conflict frequently spill across its frontier and has responded in kind when mortars and shells fired from Syria have hit its soil, in some cases killing Turkish civilians. Turkish warplanes shot down a Syrian helicopter last month after it crossed into Turkish air space, one of the most serious cross-border incidents of the two-and-a-half year conflict, drawing a rebuke from Damascus. Turkey is also sheltering a quarter of the 2 million people who have fled the Syrian conflict. It has bolstered its defenses and deployed additional troops on its border with Syria in recent weeks, with convoys of military vehicles ferrying equipment and personnel and additional short-range air defenses set up.